The Women and Children's hospital owned by former Cross Rivers State Governor Donald Duke and his wife Onari Duke has been shut down. The hospital which was commissioned in 2009 and situated along Murtala Mohammed Highway close to Ebrutu Baracks, Calabar, was shut down a few weeks back after Donald Duke and his wife visited the place and were disgusted by the state of the hospital. They immediately asked the place to be closed for refurbishment. The hospital staff was laid off and patients discharged and taken to other hospitals. No word yet on when the hospital, which is the most expensive hospital in Calabar, will be re-opened. Just hoping that this shut-down is not a permanent thing o. May they not think of converting the facility into use for a different project. For them to hv been so disgusted with the place to the extent of laying off the staff and shutting the whole place down for refurbishment means it must have Bern terrible. Also showed they opened the hospital and just abandoned it. ....for it to hv been this bad. Why weren't they keeping an eye on management and the hospital? Smh!! Good! That hospital is in a really bad state. It really needs mass fixing! The closure of the Hospital was due to the need to effect some internal reorganisation geared towards ensuring that the hospital functions at its best. As soon as this is effected the hospital will be reopened as it continues in its quest to provide World class services to all its patients. For Calabar Women and Children Hospital. HONESTLY DONALD DUKE SHOULD RUN FOR PRESIDENT, I LIVED IN CALABAR FOR THE PERIOD OF TIME HE WAS GOVERNOR AND I SAW MASSIVE TRANSFORMATION. Nigerians are their greatest enemies. People do good and yet they want the pple to constantly keep the place clean. when u dnt know something, dnt just say it. Donald Duke's 8yrs in cross river is nothing but absolute trash,wasted years without impacting any meaningful thing.if u follow donald's antecedent,u will know donald is nothing but a political rogue. Go to tinapa and see what is happenin there, nothin.the only project that he enbarked on and that is still alive is the obudu cattle ranch, which he still has half of the place to himself.somebody comment and said, he has stayed in calabar so donald should go for presidency,let me ask u a ques, is it only calabar that we have in cross rive?this is not the kind of president i want for my country. I'm cross riveriar and i equally stay and school here, so i know how it goes around here.dnt be deceived by the green grass and three u see in calabar,donald is not the right man .meanwhile,the hospital was close down as a result of mismanagement and misappropriation of fund,not because of refurbishment.the place is still in good condition,i am saying this bacause my sister work there.however,the hospital has been re-open. Wow.. Donald duke inspectin d hospital, dats gud.. It shows comitment! If it were jonathan, e wud av sent sambo 2do it,while es busy attendin parties n functions in south africa... Big ups donald! That's such a selfish thing to say?? But if na school name change or dbanj and don jazzy wahala, you go dey rant. Mtchewww!! A Fashola/Donald Duke ticket would really sell.Ihope he has not given up on this country.at least,he had & still has a shoe. Viva Naija! I applaud him for caring and doing something about it. Nigerians don't understand what maintenance is. You have to constantly keep it clean, fresh and well equipped. 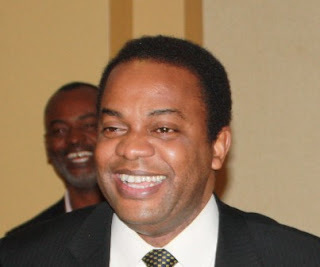 I admire Donald Duke, God bless him. MEdicine after cure! useless ppl....next time check on ur stuff from time to time. dont jst do good and get applauded and abandon the project...then resurrect it for another applaud. Gosh i am sick and tired of some ppl in naija. This is what happens when you fail to put adequate systems in place. we have a lot to learn in this country! Last time I checked which was not too long ago, that hospital was the best and definitely not the most expensive in Calabar. We should please check our facts. I do hope they reopen soon.